Next time you have a pile of corn cobs that have been nibbled ‘til the finish, make this soup stock and use leftover corn to make an easy, creamy, dairy-free soup. Have a pile of cobs but not ready to make soup? Freeze them and make stock when you’re ready. Use the stock for corn or mixed veggie soup, curries, and grains. • 6-8 ears of corn, shaved of corn. Reserve 2 cups of corn kernels for soup. • 5 tablespoons mixed herbs; choose what you like – parsley, sage, oregano, basil. Reserve 1 tablespoon for garnish. 1. Place all ingredients in a large stock pot and cover with water plus an additional 2 inches. 2. Simmer actively for 45 minutes- 1 hour. 3. Cool and strain. Set aside for soup or stock. 1. Heat olive oil and saute onions over medium heat until transparent. Season with salt and pepper. 2. Add chopped tomatoes and continue sauteeing another 5 minutes. 3. Add chopped potato, corn kernels, 4 tablespoons herbs, jalapeno (if using), stock. 4. Simmer actively, with lid cracked, for 30 minutes. 5. Cool to handle and use an immersion blender or food processor with S blade to blend. Some like it chunky, some like it smooth. Some like it hot. You decide. 6. Add lime juice and stir. Taste for seasoning. Go for a balance of sweet with a bit of heat and citrus. 7. Garnish with fresh herbs, cayenne, a drizzle of olive oil, or lime zest. Tip: The corn stock may appear a little green so be sure to use fresh tomatoes or carrots in your soup to make the color more appealing. 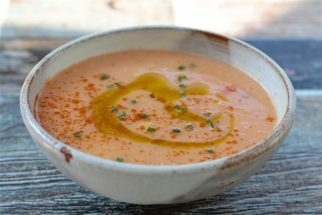 I made this soup a few times and found that tomatoes added a much-needed balance to the sweet corn.